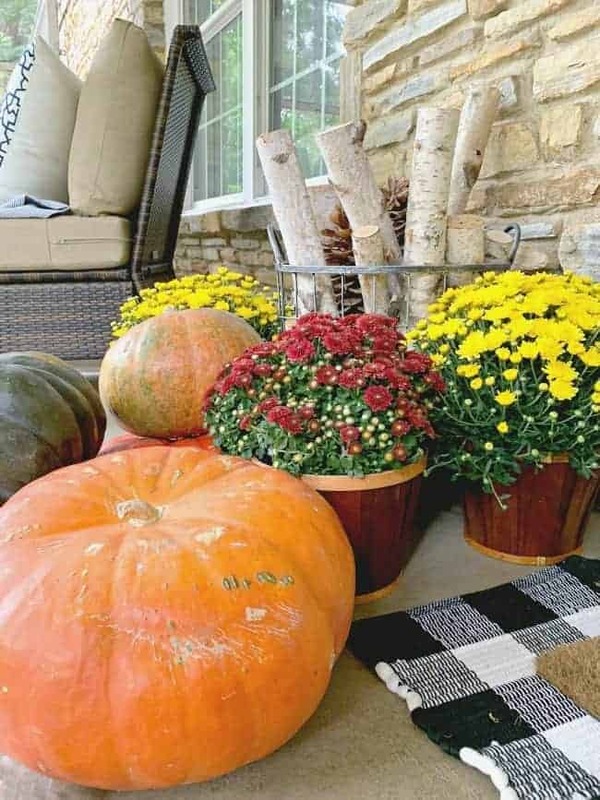 Front porch fall decor ideas. Fall is in full swing which means the front porch has gone under a little transformation (actually a couple of transformations). I haven’t done a lot of decorating but I did attempt a fall tablescape (a rare occurrence in our house) and glammed up some faux pumpkins. Today we’re moving outside to the front porch (where it was 90º yesterday). 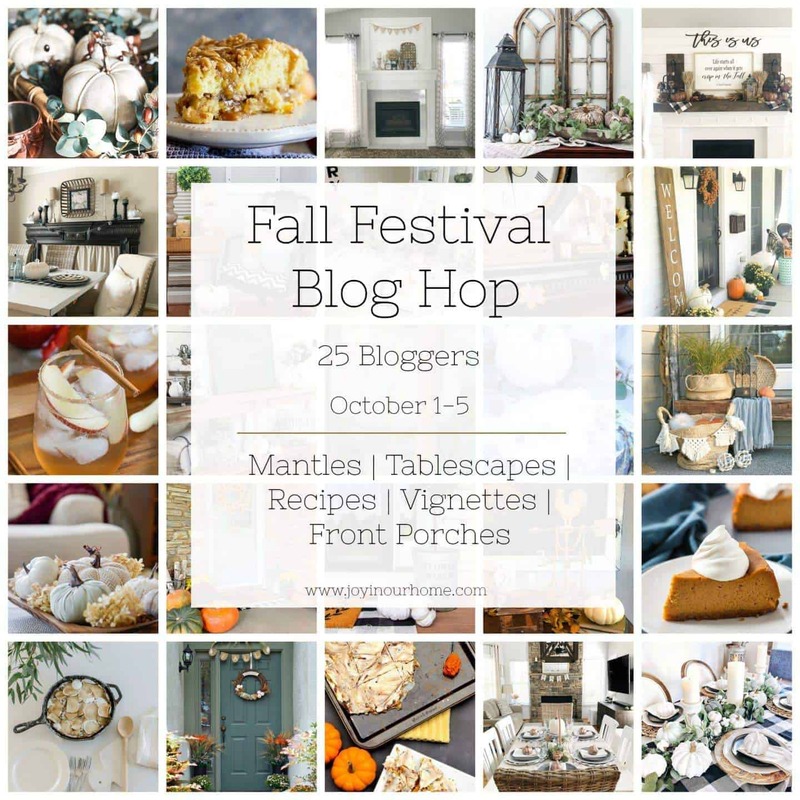 Today I’m joining in with Kendra, Joy in Our Home, for her annual Fall Festival Blog Hop. 25 awesome bloggers have been sharing their fall homes, as well as recipes, all week long so there’s plenty of fall inspiration to check out. If you’re new to Chatfield Court, and even if you’re not, thanks for stopping by! 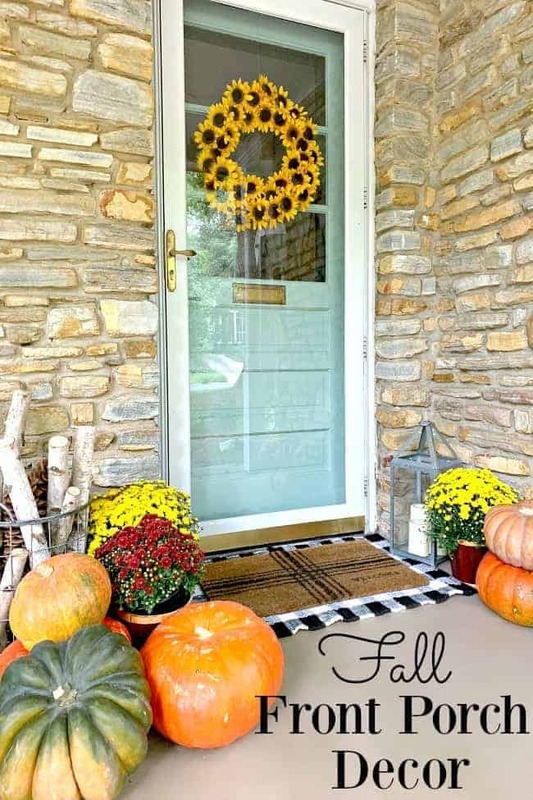 I’m so excited to share my fall front porch with you today! 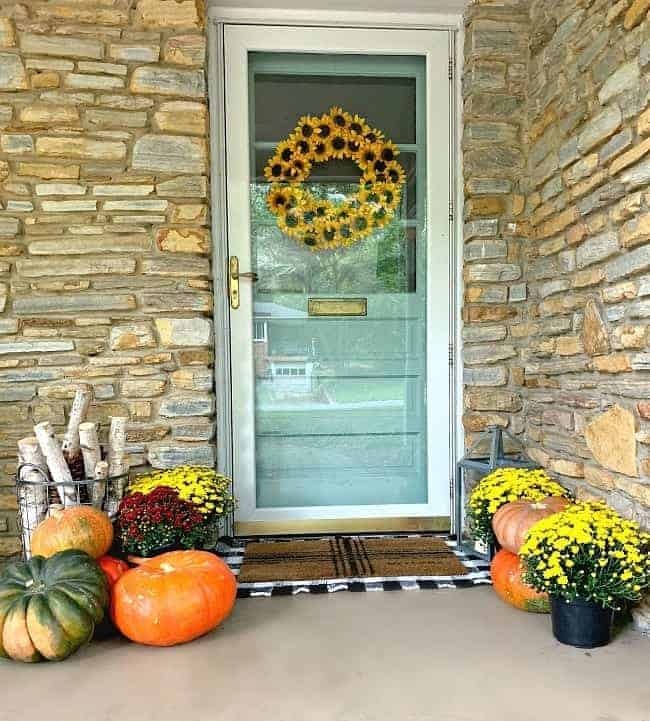 I’ve been dragging my feet and not wanting to decorate for fall this year but once I got started on the front porch, it was hard to stop. I actually ended up changing things around after I had everything set up and photographed. Yes, I’m crazy like that. Maybe it’s the heat. I still have some of the same things out here that I had out all summer, like the pillows and the throw. 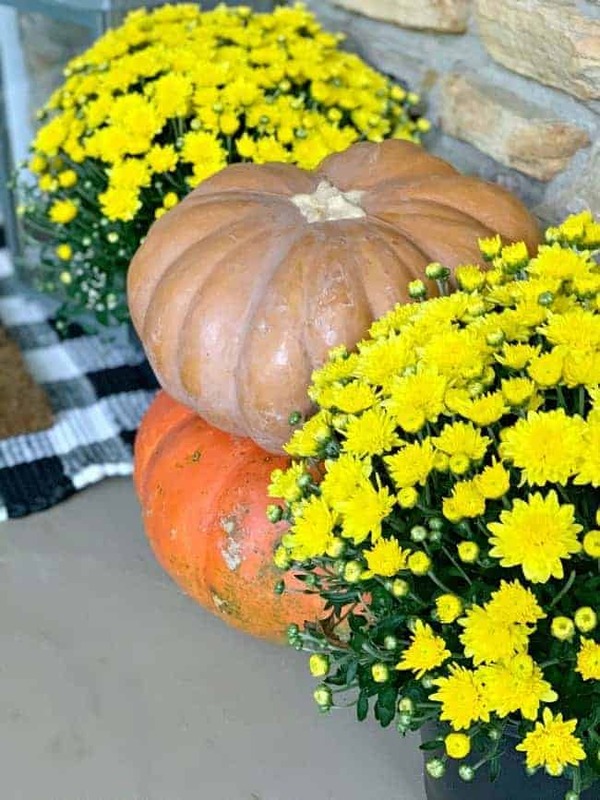 The biggest change is the addition of all of the pumpkins and mums. It’s hard to say how long they’ll last in this hot weather we’re having but they look good right now. I think my mums lasted all of 3 weeks last year so this year I just picked up 4 small ones. 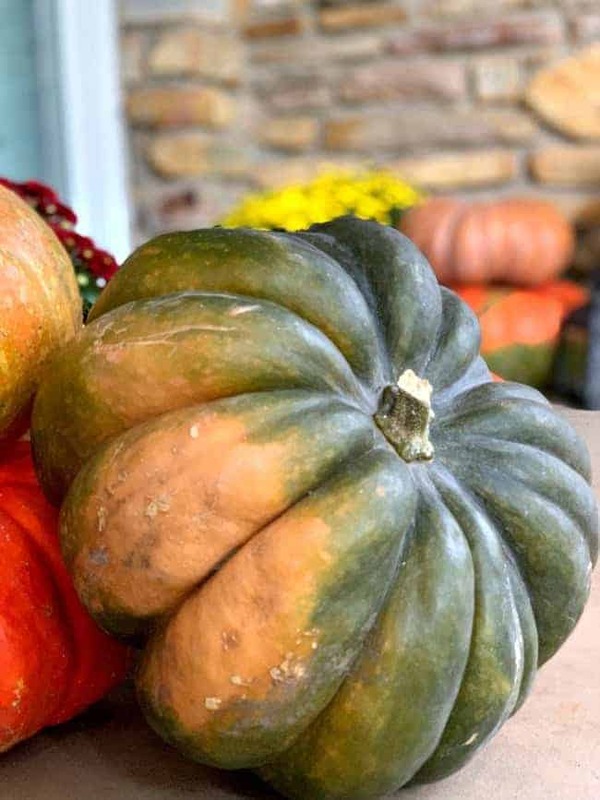 How can you resist all of the pretty pumpkins that you can find in stores and farmer’s markets now. 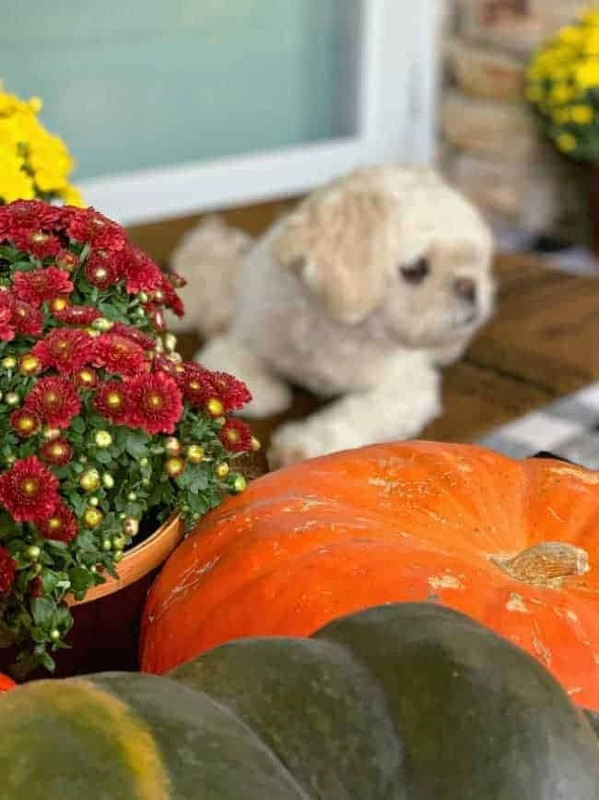 Not only can you find the traditional orange but there’s so many other colors available, including beautiful greens and blush colored pumpkins. Of course I had to have sunflowers out here. I love to see them around the cottage in the fall. Actually, I love to see them anytime of year but they always say fall to me. I made my sunflower wreath in the beginning of the summer and I was going to switch it out but decided to save some time, and money, and kept it out. So, my first arrangement was with the pumpkins and mums on either side of the door. Then I started rearranging and ended up planting the mums in my planter and bringing that back in. This arrangement is better for getting in and out of the door. I love this too. Now if I can convince the hubs to help me switch out that ugly storm door for the beautiful wood one I have in my door stash, we’d be all set. Thanks for stopping by our fall front porch. There’s a ton of fall inspiration from earlier this week so don’t forget to check it out. 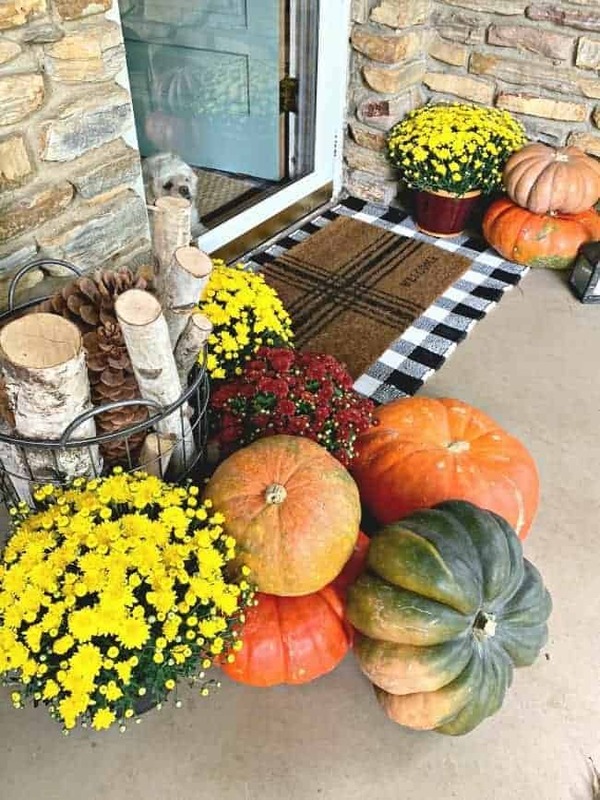 Such a beautiful fall welcome to your home! It is so happy and pretty! Thank you for sharing it! It’s so festive Kristi! I love the sunflower wreath! 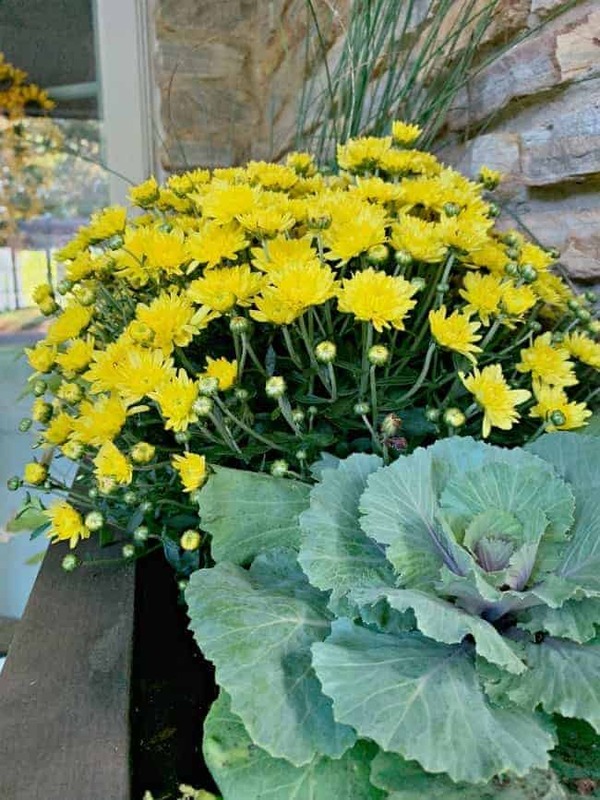 I didn’t buy mums this years for the same reason…they died almost immediately! Boo…I really wanted to use them. The pumpkins this year are beautiful, the greens and blush are some of my favorites. But I have resisted buying just yet because the weather is still so hot and humid. Just hope when I go back they are still available. 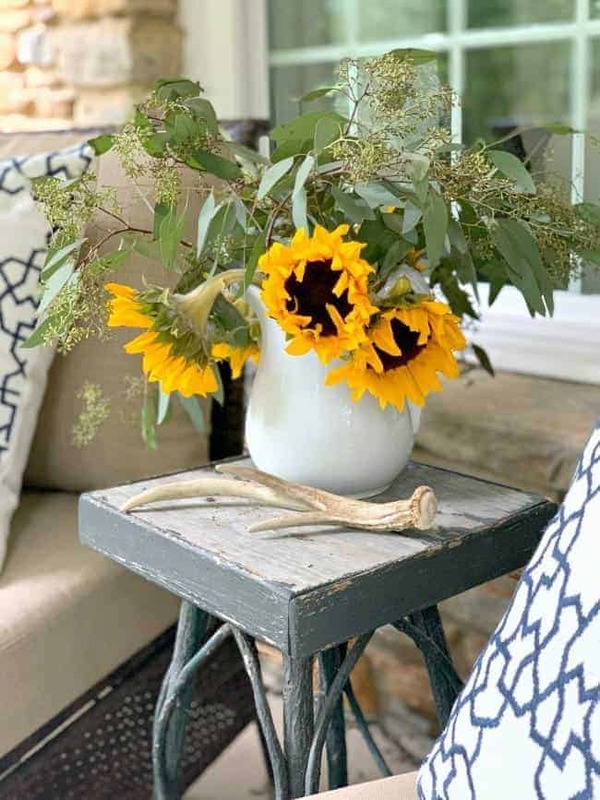 Your mums love pretty in the planter, and sunflowers are always a winner. The pumpkins are beautiful this year (I hope you can find some). I just hope that they last at least until Halloween. We are supposed to have our first taste of fall this weekend so that should help. Thanks for stopping by and checking out my fall front porch. I love what you did here and found some great ideas – thank you so much!! Thanks so much Kelly, I appreciate it! Very pretty!! 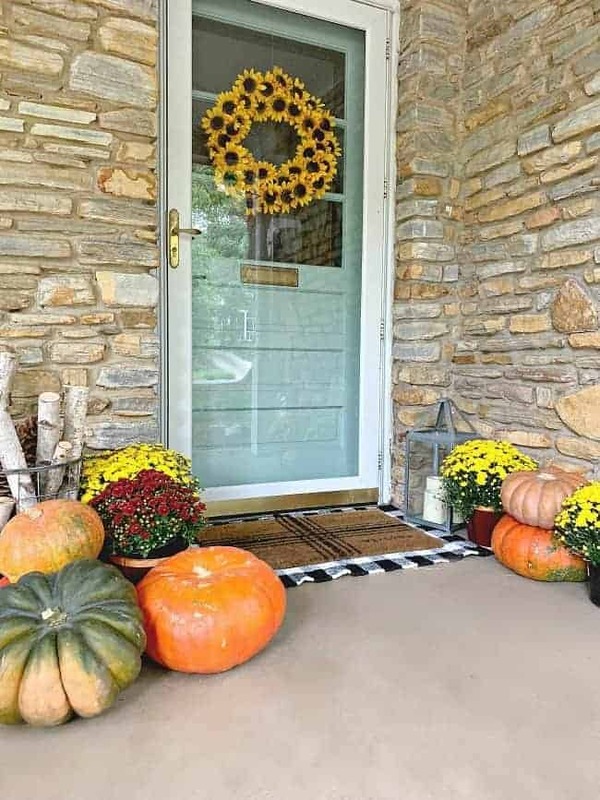 It still beach weather here, so I haven’t decorated for fall yet, but I did buy one pumpkin and put in an urn on my front porch. Of course, my bright summer wreath is still up, so…enjoy your porch!! I too would love to have a pretty storm door, but the area at my front door gets very little light due to it being inset under a small front porch, so the modern, full-view glass gives me maximum light. And, as I type this, I recognize it as a first-world problem, for sure. I really like the substitution of the planter for the cabinet that is usually there. 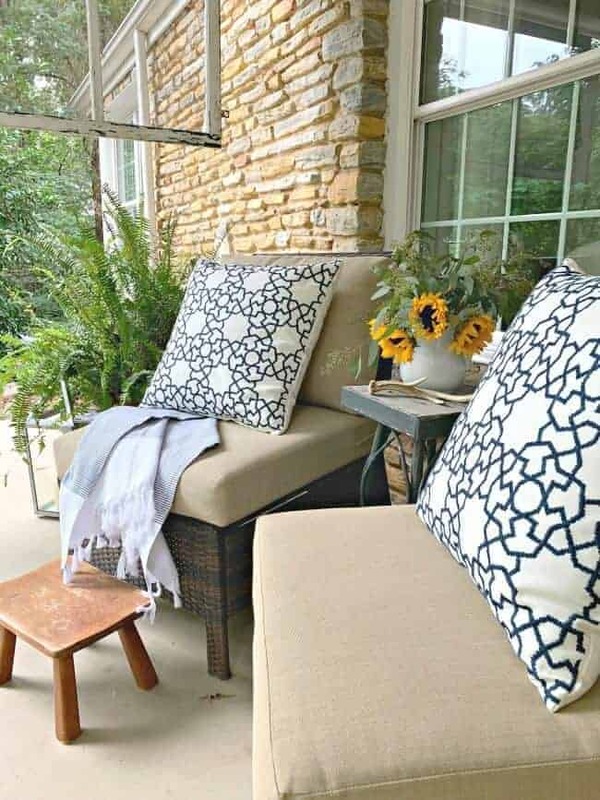 Your front porch looks amazing. Thanks so much Pat! I like the planter too. I’m having trouble getting the porch to look the way I want so I’ve been experimenting with different pieces in different places. I’ll get it one of these days. 😉 Thanks for stopping by. 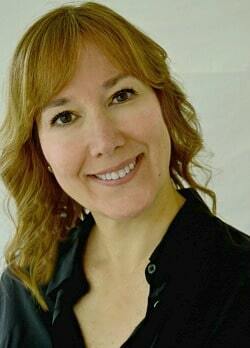 Kristi, you hate your storm door, well I hate mine because it is the old two section metal one. I, too have a door that needs to be installed but I don’t know when that’s going to happen. 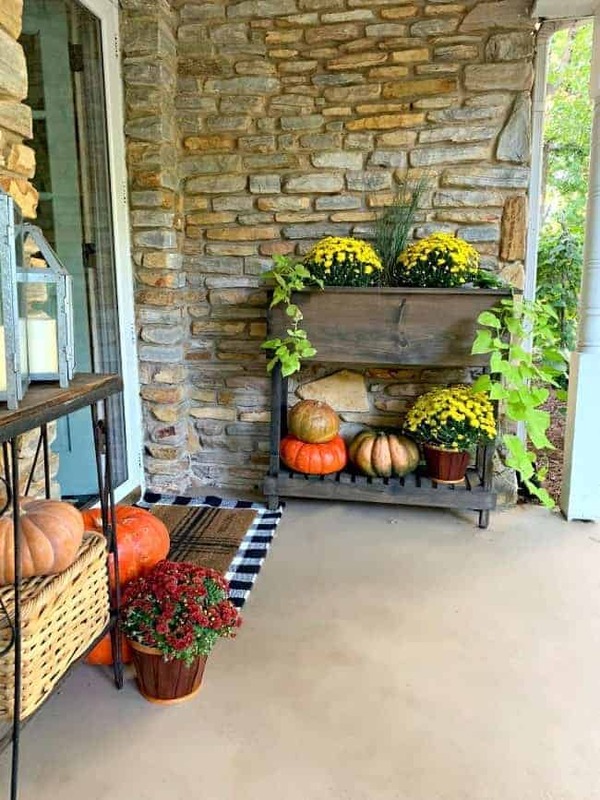 Your porch looks so nice for fall and I can’t believe the temps there! It’s been much cooler here. In fact today is sunny but we have had some rainy days. I have to ask you about your mat in front of the door, is that two mats together? I couldn’t tell. I like it and wonder where you got it? Thanks so much MJ! The front door mat is actually a woven black and white rug (from Hobby Lobby) and a regular door mat (Target). Happy fall my friend! It all looks SO lovely! LOVE all of the beautiful pops of colour! Thanks so much Kristi, I appreciate it!